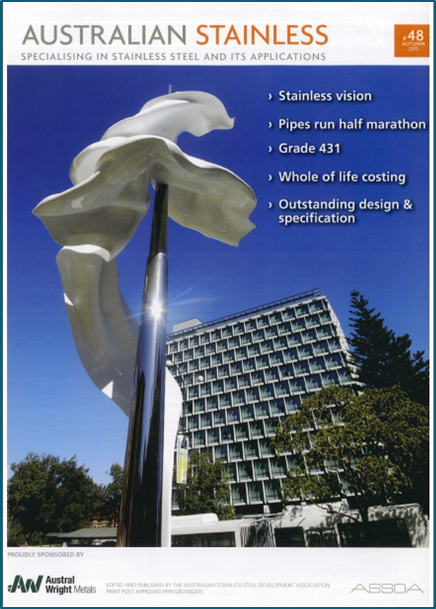 DWS were delighted to manufacture a 316 stainless steel mast & lower mounting spigot for the Ascalon sculpture which is currently situated outside of the St. Georges Terrace Cathedral. This was manufactured in accordance with Australian Standard AS1554 Part 6, and all structural purpose welds were both visually inspected and DPI tested. The mast and all attached parts were highly polished and all welds were coved or sanded smooth and then polished to blend in with the pipe. For your viewing pleasure, the video links below show the Ascalon sculpture being erected.